When we say your pets are our priority, we really mean it. Animal Tails is the first employee-owned and operated vet practice in the UK - you will see the same faces each time you visit and, as a result, experience a continuity of care not often seen these days. ​01786 474471 TO BE CONNECTED WITH VETS-ER, OUR DEDICATED OUT-OF-HOURS PROVIDER. Behind the surgery is our large, private car park which provides easy access and takes away the stress of finding somewhere to leave the car. Therapeutic Laser Therapy is available at the surgery - we are the only practice in the Central Belt offering this revolutionary treatment. In addition, we offer other complementary treatments such as acupuncture. Our preventative Pet Health Plan provides clients with fantastic savings & discounts. Remember to 'Like' us on Facebook, Twitter and Google+ where you can see lots of our patients, fun stuff, competitions & interesting cases and be kept bang up to date. 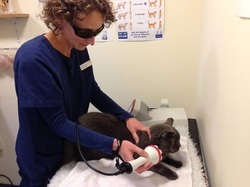 As the only practice in Central Scotland with this Class IV Laser Therapy unit, we are pleased and excited to be able to offer the treatment to our own patients and to non-patients from other practices on a referral basis. Our Pet Health Plan is here to help you, your pet and your household budget. Fantastic savings to be made and special discounts too. Helen, as well as being a veterinary surgeon, is our acupuncturist at Animal Tails. This very well tolerated treatment is available to our own patients and to those from other practices on a referral basis.